Hello and welcome to another episode of Coexisting For Nonhuman Animals, ok, lets start again, Hello and welcome to another episode of Coexisting With Nonhuman Animals. Before I begin, I'd like to mention another podcast I appear on. I join my good friend Andrew Blyth to record two shows, The Patriotcast, about the Metal Gear Solid series of video games, and the Jay and A show, or as it might now be known, The Casual Talk Show. We are just two friends, on other sides of the world, talking about tech and topics which interest us. We often talk of the Soviet Union, Andrew was born in Ukraine. Theres more where that came from, if you'd like to be our FOURTH listener, theres always a good 30 minutes between friends available. The last episode, we spoke of Lip Syncing, Cures for aging and the Microsoft Kin, another incredible product from Microsoft, cancelled after being on the market a few weeks. We meet on Skype late Saturday time for Andrew in London, about 8am Sunday morning my time. You can find the show on iTunes by searching for "Casual Talk Show", its by Andy Blyth, or by going to bit.ly/casualtechshow , thats the iTunes page. Who am I kidding, I love the No Agenda podcast, with Adam Curry and John C Dvorak, and once after donating, John misread my message, the half million listeners of No Agenda were told NZ Vegan Podcast was MINE. Absolutely not "carnivore curious", and it really bugs me when people who are not vegan say "I'm a carnivore". If I ever meet Elizabeth, I'll be too embarrassed to look her in the eye, she only has one eye you know. She forgave me for the presenters mistake, when it seemed I had stolen her show, so surely I can forgive her brutal crime of getting "with" and "for" wrong. For this episode, I'd like to cover the "Center For Consumer Freedom", who serve as lackeys to the Tobacco fast-food and Animal Agriculture industries, telling the American public tales of how Animal Welfare and Animal Rights organizations all want to take away US Sovereignty, and force farmers into slavery. Or something like that. "The Center for Consumer Freedom (CCF), formerly the Guest Choice Network, is a non-profit American lobby group. It describes itself as "dedicated to protecting consumer choices and promoting common sense. It describes its mission as defending the "right of adults and parents to choose what they eat, drink, and how they enjoy themselves." CCF opposes compulsory warning labels on food, bans on smoking in restaurants, and lawsuits related to obesity. It runs media campaigns and gives out annual "Nanny Awards." "
"Berman's companies have run numerous media campaigns downplaying the dangers of obesity, smoking, mad cow disease and drunk driving, as well as criticizing the minimum wage"
60 Minutes has called him "the booze and food industries' weapon of mass destruction,"and his nickname (from both friends and enemies) is "Dr. Evil", an alias in which he takes pride. Berman had an appearance on the Colbert Report where he came across fairly moderate, although that is compared to the character of Colbert. What a strange position, to find yourself defending smoking, fast-food, denying causes of childhood obesity , mad cow disease and drunk driving. In New Zealand, we normally say "drink driving". The more I learnt about "The Center For Consumer Freedom", the more fun i had. Its difficult to believe this is a real company, group, front organization, whatever term you'd like to use. The main person from The Centre For Consumer Freedom I'd like to focus on is David Martosko, I'm going to try and say his name right through this episode. I noticed Martosko appearing in many different Animal Rights movies, after searching for him on Google, I found out about CCF. David Martosko has many different interviews and speeches which you can find online, I'd like to play clips from a few of my favorites. I've always found it odd when people describe Animal Rights, as if its a negative or extreme idea. To me, the idea of leaving other animals alone, not caging them, not forcing them into pregnancy, not killing them, it all seems obvious. To argue otherwise comes down to "oh, but what they want doesn't matter, they are property" or "but we treat them well when we kill them". I've noticed that a pro GE crops position is to mention Africa, the starving poor of Africa. "Oh, but surely you don't want the starving Africans to die, do you? Do you want the starving Africans to die? huh? huh? huh?" The companies peddling their souped up wares have one solution, GE food crops of course! The only way to help starving people, oppressive monocultures, sprayed with increasingly potent chemicals to combat evolving tolerance. What a terrible thing, tolerance, we MUST destroy it, at least until the next inevitable wave pops up, and the vicious cycle continues. I'm using Mice as an example since they were who David mentioned, lets not forget Dogs, Cats, Rabbits and all other animals subjected to who knows what. This reminds me of a failing general, demanding more troops during warfare. A Troop Surge if you will, when nothing is working out. Are we to just keep adding more and more troops, more and more animals into the equations, until hopefully something breaks even? I'd rather argue for an instant withdrawal. And if diseases are so important, if its so essential to quote "cure cancer", why are we not taking human children, from the poor, heck, those starving Africans are going to die anyway right, because of the GE protesters, lets use them. Like how Sarah Palin blames environmentalists for the Deepwater Horizon Oil Spill, because those pesky protesters wouldn't let her "drill baby drill" on land. Instead, they drill out in less practical areas, when the perfect solution is looking right back at them, with a smile on his or her face. Perhaps evil companies ARE testing on orphans as we speak, behind closed doors. If we were against testing on already forgotten humans, are we against quote "curing cancer?". Surely, there can be no doubt, if there is benefit testing on animals similar to us physically, then there would be almost PERFECT experimentation subjects in using Human beings for human problems. But surely, nobody would argue that publicly. I know that in New Zealand, we experiment on Beagles, we experiment on dogs. Yet, David Martosko used the example of mice, and yes, they are by far the most used animals, but would he also argue that we should use dogs and cats for experimentation? I think most people would have more of an issue with that. And its happening right now, around the world. And as with seemingly everything, there are doctors who speak out AGAINST Animal Experimentation. Just listen to the second episode of Victor Schonfeld's "Animals and Us", I've included a link in my notes to an Abolitionist Approach article about the two pieces, as well as Schonfelds article "The Five Fatal Flaws of Animal Activism". I am against experimenting on animals, because I don't see a difference between experimenting on an unwilling mouse, and an unwilling man. If there were a sure cure to cancer by testing on a single man, I would gladly volunteer, for the good of mankind, possibly womankind as well, we are from different planets, who knows how similar we are. But theres NOT any guarantees, and so I havnt donated my living body to science just yet. I have nothing against farmers personally, just as I try not to have anything against people who eat or wear animal products. I have absolutely no desire to use animals, I feel quite sick just seeing others wearing leather, drinking milk or eating meat. I was upset when my primary school principal came up to me, and placed her leather gloves on my back and chest. I find leather revolting, absolutely awful, I'd rather step barefoot in chicken poo than touch leather, absolutely. Those little friends of mine make a hell of a mess in a short time, six chickens, all sleeping in the same spot, they can make quite a mess within a week. I properly clean the chicken coop each week. I can always wash away chicken waste, I cant bring an animal back to life, and return his or her skin. I do admit, I wont stay in the same room as someone eating Chickens. Thats my limit, to think about how my friends can see and want to pat my little friends, and to talk about how they are hungry for chicken meat, its just sick. I know that my soft little friends are no different to any of the billions of chickens killed each year, solely for our pleasure, and I just cant be around people eating my little friends. You might call me a speciesist for getting upset over Chickens in particular, I guess I'm guilty as charged. Anyone listening will know how much I love Chickens. Californian Dairymen? As in Californian Cows, like these ads? "Freeman declined to reveal the budget for the commercial shoot or how much the board is saving by filming in New Zealand. He added that any scenes involving California cows will be filmed in state. "We would never misrepresent California cows by shooting them elsewhere," he said." A three day use of a soundstage here in New Zealand is mentioned, so what, they come all the way to New Zealand, to record the speaking parts? But not the scenery? Not New Zealand cows? That seems bizarre to me, perhaps someone with experience in commercials can explain the situation to me by email. I'd think "any scenes involving California cows will be filmed in state" could be a trick, that simply, NO californian cows would be included, at all! "we would never misrepresent California cows by shooting them elsewhere", yeah, well it wouldn't make much sense to fly cows to the other side of the world with you, in first class, would it? If anyone can explain, please email me. Heres another clip of a quote "Happy Cow"
You did travel the world, to New Zealand, to film in New Zealand. If you're going to come to my country, and film New Zealand cows, at least bring the best of your music. Well, I wouldn't consider Katy Perry your best, but Dr Dre, he's definitely a National Treasure, especially when he brought in universal healthcare, and will probably have something to do with promoting medicinal marijuana. Its hard to believe, that adverts espousing how great California is, the eighth largest economy in the world, Silicon Valley, the setting of Grand Theft Auto San Andreas….and you have to come to a minor nation, four million strong, to film quote "californian cows"? You may have heard that recent one liner, "its like getting a Vegan to butcher your meat", well, this Vegan just fixed your ads, the worst animal rights "own goal" since Vegetarian Michael Jackson popularized leather jackets. I've mentioned before the numbers of animals killed by PETA. I am not a vet, I could never "put down" an animal. I've been with family pets as its happened before, and found it awful. I couldn't do it. I guess there will always be cases where killing animals, as in putting them to sleep, really is the best we can do. Such as if you find an animal hit by a car, with no hope for recovery. I couldn't don't know if I could do it, but I guess it might be necessary. I can understand if Animal Shelters "put down" animals, I think its horrible, I think its awful, but maybe it is needed. I don't know, I am not a vet. The thought that every day, unwanted animals are killed, because they are taking up space, requiring food, its tragic. I can understand killing fatally injured animals though. I cannot defend PETA, how they seem to kill nearly every animal they take in. I think thats shocking, and horrible, it deserves all the media coverage possible. But, for this "Center For Consumer Freedom" to use this against PETA, an Animal Welfare group that claims to be Animal Rights…"oh my gosh, PETA kills animals! ", get real. Your corporate overlords, lets call them "The Meat Industry", they kill FAR more animals each year than PETA have in their entire history. 56 Billion land animals each year. If you believe its wrong to kill animals, while working for The Meat Industry, you're simply wrong, you've shot yourself in the foot, a thousand times over. I don't want to defend PETA, I try to avoid mentioning them while talking about Veganism, but sometimes they just come up. I think many people around the world know of PETA, and they see Animal Rights as meaning PETA. If I mention I'm Vegan online, I get people launching into attacks about how PETA kills thousands of animals each year. I'm glad to have a logo "Vegans Against PETA" on my blog, and also, to know that I'm not the only Vegan who disagrees with PETA. You can find Barbara at Veganacious.com, she also has a terrific podcast edition, which you can find on iTunes, just search "Veganacious". I'm going to revisit PETA killing animals on my next episode, about Penn and Teller. I guess its to be expected. I look at "Meat Trade" websites, and post on Farming websites. I've never lied, or hidden to secretly film farmers though, I think thats more than a little creepy, although, I do watch the footage thats sent around the internet, and included in documentaries such as The Animals Film and Earthlings. I must comment on this downright lie. As you probably know, I do not agree with PETA. However, when things are said against PETA in the media, people associate those feelings with Animal Rights, even when its just another silly PETA welfare stunt. I've heard this lie multiple times, from different sources. According to PETA, they were hounded by the press for comment when President Obama killed a fly. I'll read from the PETA blog, which I've linked to in my shownotes. "Well, I guess it can't be said that President Obama wouldn't hurt a fly. The commander in chief was recently pestered by a fly during an interview. He swatted at the insect and killed the little guy instantly. If all this has you wondering how you can be a bigger person (figuratively, as well as literally) in your dealings with exoskeletal beings, check out our handy-dandy bug catcher—one of which we are sending to President Obama for future insect incidents." Good old Welfare groups and their ads for things they sell. I myself have a favourite plastic container for catching insects inside, to return them to my garden. Its a cup sized chewing gum container, with a clear plastic hinged lid, I place the cupped section over the insect, and carefully close the lid. Simple, I bought some chewing gum for a couple dollars a few years back, and still have a "bug catcher" to this day. Its not as if its difficult to gently place bugs outside. Just today I found a MASSIVE Stick Insect as I walked home, he or she was sitting on the pavement, looking terrifying. How such a gentle herbivore can look so scary, I don't know. They have mouth parts like a human hand, with fingers that rasp at leaves. They look a lot like a lobster up close. I took this massive little guy, or girl, home, and released the insect on some bushes. I've found stick insects there before, I know they like eating that plant. Many people I know would have actually STOMPED the stick insect, perhaps they would have been curious about such an unusual bug, but I think most people would have killed him or her. I remember my own father, as he was chopping down a tree, his axe was swinging towards the tree trunk when I noticed a Stick Insect. I yelled for him to stop, and very angrily, he barely missed. He couldn't believe I had stopped him. If he hadn't stopped, I probably would have grabbed the handle of the axe, and deflected it from the tree. He would have cut the stick insect in half, without a care in the world. I also know that his cat likes pulling the legs of Stick Insects, they are so slow moving, and they freeze, in an attempt to hide, while cats just pull them to bits. I sometimes find stick insect legs in the garden. I have no idea how anyone could fail to appreciate the Stick Insect. I have a personal story, when a Stick Insect truly saved my life, but perhaps thats for another time. I'll link to photos of this latest Stick Insect on my blog soon. PETA never went ballistic over quote " Flygate " as is commonly claimed, they were asked for statements, and from what I just read, it was quite fair, not extreme in any way. Its logical, that someone who truly respects animals would want flies to NOT be crushed, to instead be put outside. And PETA never went to the media about the video, the media were kicking down Ingrid Newkirks door, according to PETA. If someone came to my world famous blog, asking for my comment, I would have said the same thing, I think Vegan would have. Of course, we cant be seen as endorsing those crazy Animal Rights radical extremists, so when something positive, or at least non extreme comes from an Animal Welfare/Animal Rights group, it can NEVER be mentioned in the mainstream media. I don't like or agree with PETA, but the truth is the truth. The " flygate " story reminded me of another MYTH, of the British quote "loony left", radical left wing politicians coming up with some decree against the nursery rhyme "baa baa black sheep". I've linked to a Wikipedia article. Briefly, a few newspapers mentioned a private school which had apparently banned the nursery rhyme, saying it was racist. A new version had been thought of, "baa baa white sheep", before the song was banned altogether. This all occurred at one nursery school, and was far from some liberal fiat forced upon the entire country. This spiraled into "baa baa rainbow sheep", and talk of quote "political correctness gone mad". I quite like the idea of Animal Rights propaganda nursery rhymes though, with truth to them, Baa Baa Vegan Sheep, h ave you any wool? Yes Jordan Yes Jordan and thank you for allowing me to keep my own skin. I'm not very good with writing nursery rhymes, although I'd like to write a childrens book about Chickens, "The Hungry Hungry Hen Friend", a rip off of "Hungry Hungry Hippos". As a demonstration of just how hungry Chickens get, have a look at my recent YouTube video of my little friends, you can find it on my blog, or by going to bit.ly/chickensax , s a x. You'll understand after hearing the video. Yes David, its an outrage when someone advocates leaving animals alone, and not treating them like property. I also have an interview of David with Alex Jones. We really have nobody half as crazy as Jones in New Zealand, I think our right wingers would overdose if they ever heard his rants. I'm just going to leave these comments by themselves, I found them outrageous, but almost hilarious at the same time. Woah, I hope you were sitting down for all that. To be fair, that was mostly Alex Jones, but David knew who he was being interviewed by, and seemed to agree with what was said. Unbelievable anecdotes. I had some lame attempt at a joke, asking other Vegans to join me in saying that I couldn't believe PETA were HALF as crazy as what Alex and David would have you believe. I would also like to mention, I'm Vegan, I do NOT secretly desire to eat animal byproducts, no interest at all. I think you'd have to be Alex Jones level crazy to suggest what we do to animals. In an originally Vegan World, you'd be thought insane for suggesting we force cows into pregnancy, that we cut beaks and tails off, that we keep chickens in cages. Whatever nonVegan use you might force upon Chickens, nothing beats patting your little friends, as they eat grain from your hand. Of course PETA is not the worst threat to your freedom, its not like they have WMD's. I don't think the big bombshell that PETA kill thousands of animals a year is so shocking, when your backers kill BILLIONS. I agree, PETA is a big joke, I hate their sexist stunts, and how they spend so much money to get so little achieved. I hate that they kill so many animals, it seems highly excessive, surely those animals could be found loving homes. Who knows the total cost for each one of their declared "victories", when probably, The Meat Industry would probably have switched in their own time. Most of the successful "welfare changes" seem to also be more efficient….PETA even announce the savings for the slaughterhouses…. I cant agree with PETA. I want to help animals NOW, not in fifty years when some law change to increase cage sizes four atoms comes into effect, now. 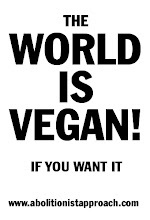 Animal Rights helps all animals, so I promote Veganism. You know who really sounds like a threat to our freedoms though? An evil front group funded by massive corporations, peddling tobacco, fast food, and animal byproducts, that pretends to be looking out for the little guy. Don't be fooled. "Californian" Happy Cows ads….filmed in New Zealand! PETA's official comment on "Obama fly swatting"
"loony left" "baa baa white sheep"
Thanks so much for this great podcast; I just discovered your blog. It had my blood boiling very early in the morning! Keep up the great work. (p.s. my name links to my blogger account which I never use. www.dianafleischman.com is my url).